Early in the 1980s, a pop legend in a mid-life lull reached back into ancient history for inspiration. The song did not come easy. Banging his head in frustration on a hotel-room floor, Leonard Cohen ground out about 80 stanzas before finally achieving the perfect anthem that is “Hallelujah”. CBS Records rejected the album. After a 1984 indie release, “Hallelujah” hung in limbo for a decade until Jeff Buckley, sighing deeply over a steel guitar, gave a soft, introspective reinterpretation. Buckley’s death by drowning in 1997 added a tragic aura to the song. The producers of Shrek called in Rufus Wainwright to record it for the soundtrack. Cohen, having been fleeced by a felonious manager, went back on the road, singing “Hallelujah” in a trademark brown hat. X Factor hopefuls heard it and one belted it out to victory. Suddenly, “Hallelujah” was being downloaded 100,000 times a day and turning into the most covered pop song of the 21st century. Amid the resurrective clamour, few grasped the leap that Cohen had made into the past. In the depths of despair, he had sought the “secret chord / That David played, and it pleased the Lord” across three millennia of human creation, appealing as one lost Jew to an ancestor for the primal gift of music. I knew, too, that a woman’s voice was proscribed by the Talmud as “nakedness” and that hearing a woman sing was equivalent to having an illicit sexual liaison. Thrilling as that may have seemed to my boyish mind, women’s singing really was taboo. As was listening to music for seven and a half dark weeks of the year and at times of personal loss. In sorrow, music was the first thing to be switched off. So when Radio 3 commissioned me to make a three-part series about music and the Jews, I made the decision to avoid popular cliches of “Jewish music” – klezmer bands, cantorial wails, Ladino lullabies – and focus on some of the bigger questions. How, for instance, has music shaped the character and history of the Jews? How did Jews influence music? Biggest of all, can music define personal and collective identity? I started where Cohen did, in search of the elusive King David: poet, musician, warrior, sexual malefactor and author of a book of psalms that forms the basis of worship for Jews and Christians alike. Though there isn’t much evidence that David wrote all or any of the 71 psalms that bear his name, we cannot read them today without becoming aware of this musician’s private world, his inner ear. Time stops still on the wall of David’s city. Yehoshua’s reading of Psalm 51 is that David was rendered musically, and perhaps sexually, impotent by guilt, an idea that does not exist until Freud adduces it in 20th-century Vienna. Could Jewish guilt be rooted in Jewish music? American composer Steve Reich came to Jerusalem in the 1970s in search of his Jewish roots. His epiphany arrived while listening to the way Yemenites enunciate the Psalms. “I just had to chant a verse [with them],” he recalls, “and a melody popped into my head. What is that? It was an unconscious dredging up of Bulgarian rhythms from Béla Bartók, changing rhythms in The Rite of Spring, all unbidden. But it introduced a new kind of rhythmic writing for me, a specific idea of combining twos and threes into five/eights, seven/eights; something I hadn’t done before.” Reich considers his psalmic score, Tehillim, to be his towering masterpiece. Tehillim were the songs of the temple. The search for their lost music is a bimillennial obsession. In 1905, a cantor called Abraham Zvi Idelsohn arrived in Jerusalem from South Africa and, like Bartók in the Balkans, began recording old men’s songs on wire machines. Applying new techniques of academic musicology, he surmised that the Jews of Yemen came closest to temple music. At the National Sound Archive in Jerusalem, I played Idelsohn’s cylinders and consider his boldest conclusion – that Yemenite-Jewish microtones lie at the root of Gregorian chant, and hence of all Christian music. The power of life after death was vested in a woman. “She was the only one who had this right. People were very afraid of her, very respectful,” says Gamliel. When the keening ends, the woman recomposes herself, then tells a joke. Life must go on. Myriam Fuks from Brussels is an eighth-generation Yiddish singer whose repertoire has passed from mother to daughter for two centuries. Myriam’s mother, Frania, sang in Warsaw theatres, survived the Warsaw ghetto. Myriam wakes in the morning with fragments of Frania’s hundreds of songs. Unable to remember the refrain, she asks the pianist Martha Argerich to improvise for her on a new recording. The need to keep memory alive by song, I discover, a driving Jewish motivation. It was the late 1820s before Jews were allowed into western music. There had been isolated intrusions – Salomone Rossi in Monteverdi’s Mantua, Lorenzo da Ponte in Mozart’s Vienna – but it took a pair of bankers’ sons from Berlin, Felix Mendelssohn and Giacomo Meyerbeer, to change the culture. Mendelssohn, aside from his own concert works, restored Bach’s oratorios to public performance – “giving classical music its Old Testament”, according to one of my contributors. Meyerbeer blew out the walls of existing opera houses with gargantuan music dramas, paving the way for Richard Wagner and the romantic imagination. Wagner, in a notorious 1850 pamphlet, “Das Judenthum in der Musik” (“Judaism in Music”), named Mendelssohn and Meyerbeer as symptoms of the Jews’ “infinitely small” ability to write music. He demanded the exclusion of Jews from German music, a blueprint for Hitler’s ethnic cleansing. Like most bigots, Wagner lived in fear of the other, the unknown, the unimagined. At the end of his century Arnold Schoenberg, exasperated to his Jewish core by the tonal corsets of German music, ripped them off in two creative revolutions, atonal and serial. Orchestral music would never sound the same again. How Jewish was that? George Gershwin, the most restless and creative of the early writers, never concealed his Jewish roots. When he sang “It Ain’t Necessarily So“, he not only challenged Scripture with Talmudic argument, he actually sang it in the traditional mode of Talmudic study. Visiting the Yiddish theatre star grandparents of the conductor Michael Tilson Thomas, Gershwin talked of the freygish mode as the key to America’s popular music. Freygish is Yiddish for questioning. What Jews added to pop music was a quizzical note. Schoenberg’s last words on a sheet of music paper were: “Ich bin ein kleiner Judenbub.” (I am a little Jewish boy.) Gustav Mahler used to say: “A Jew is like a swimmer with a short arm. He has to work harder to reach shore.” Jews made music out of an awareness of their Jewishness. That perspective makes a generic concept of “Jewish music” uninteresting and largely irrelevant beside the transformations that Jews brought to music wherever they lived, and the changes that music wrought in the matter of being Jewish. Could anyone, I have always wondered, be Jewish without music? “It doesn’t matter which you heard,” sings Leonard Cohen, “the holy, or the broken.” Hallelujah! joined them that their textured folk-rock sparkled. on radio, during a headline slot on a Friday night in Manchester. and giving the audience what they want. the station took the alternative route. Blur and Gorillaz frontman Damon Albarn has given his wistful debut solo album its first live airing at the inaugural BBC 6 Music Festival in Manchester. Albarn has described the album, titled Everyday Robots, as the most personal of his 25-year career. On the evidence of Friday’s gig, he has made it more contemplative, nostalgic and unsettling than his past releases. Albarn headlined the first day of the festival at the Victoria Warehouse, two months before the album comes out. Although the record will be released under his name, he said he wanted himself and his backing band to be known as The Heavy Seas. “This is our first ever gig and it’s quite nerve-wracking to be not only playing your first gig but playing it live on radio as well,” he told the crowd at the venue and the audience of 6 Music listeners. Albarn’s youth in east London and Essex is the inspiration for some of the songs, such as Hollow Ponds, which recalls the hazy English summer of 1976. Discussing the album on 6 Music before the concert, he said: “The narrative of it is completely personal. In many songs, he also examines the impact of technology on modern life. “By going to where I came from, I got a good perspective on a time where there were no telephones apart from the one in your house,” he recently told Rolling Stone. Albarn’s set was interspersed with brighter moments such as the jaunty track Mr Tembo, about a baby elephant in Tanzania. “I wrote this song for him and it ended up on the record somehow,” the singer said. His band name is taken from the title of the album’s final track, Heavy Seas of Love, which includes vocals from Brian Eno. 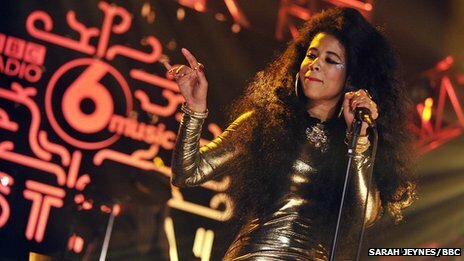 The record also features Natasha Khan of Bat for Lashes and the Leytonstone City Mission Choir. 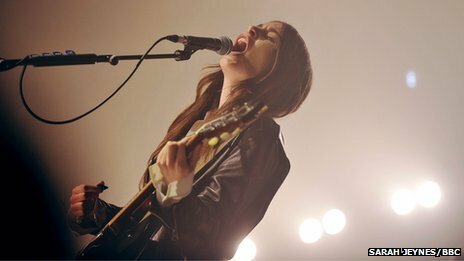 The first day of the indoor 6 Music Festival also included sets from bearded Texan band Midlake, riotous Californian rockers Haim, US pop diva Kelis and electronic pioneers The BBC Radiophonic Workshop. Franz Ferdinand, Jake Bugg, James Blake and The National will play on Saturday. 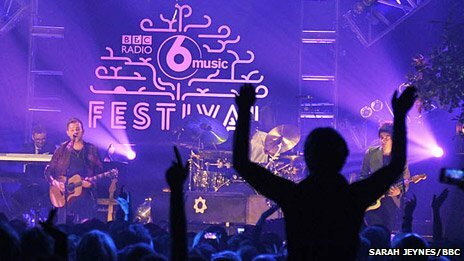 “We’ve always had great live moments,” BBC 6 Music editor James Stirling said. “But we’ve never had something truly of our own. He added that he would like to make it an annual event.